You may consult Facebook page (UN Geneva), twitter and flicker accounts and the United Nations official website in New-York for more information. As you may have already observed there are Canadian First Nations leaders proudly stepping into uncharted territory. In assisting GA-FGM they’ve heard with their heart, their sisters of the southern hemisphere cry for help and responded to it. Even though they themselves by their own tradition are not directly impacted by FGM. 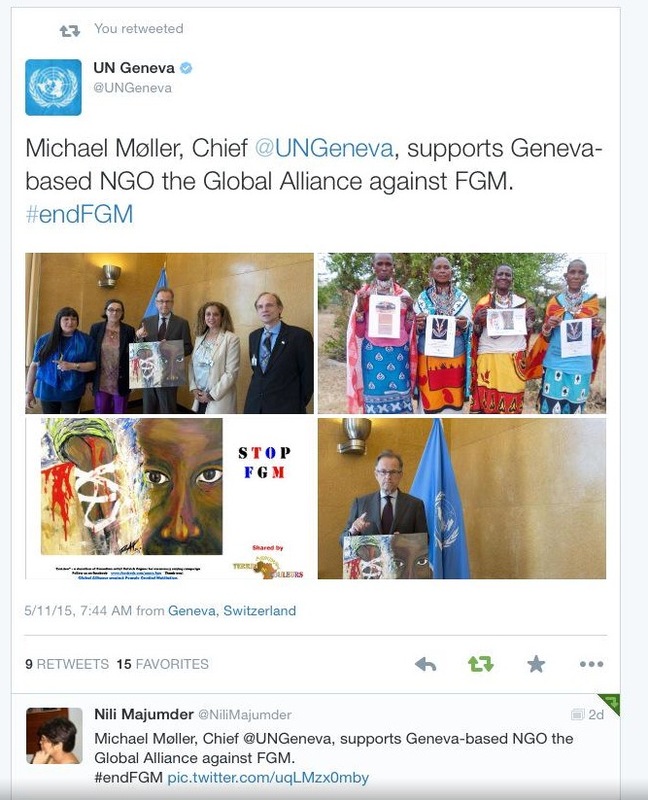 In picture above, UNOG’s DG (middle), the co-founders of the GAFGM, Holger Postulart and Elizabeth Wilson (right), 2 of GAFGM Goodwill Ambassadors, Captain Christine de St Genois GA-FGM’s Ambassador to the United Nations and Pat “Halfmoon” Bruderer, GAFGM’s Ambassador in Canada (left). Pat is the first Aboriginal woman to step into the cause. Also, since Februrary 5, 2015, Great Chief Constant Awashish (PQ), became the first Aboriginal Chief to support the global fight against FGM.